"SADA Memories - Thoughts on Justice"
"This is a portrait painting representing pioneer Japanese American women. The artist's mother, SADA, served as the model for this work. Now in her susnet years, SADA is reflecting upon the joys and sorrows of her life in America, the hopes for a bright future as a young woman immigrant experiencing a different culture in a new country. This experience is symbolized by painting the backs of two kimonos floating at the top of SADA's image. She encounters prejudice and injustice resulting from World War II and the issuance of Executive Order 9066, whereby she was imprisoned in the U.S. concentration camp [Gila River, AZ] along with approximately 120,000 Americans of Japanese ancestry. After more than four decades Redress was offered by the federal government." "Sada is my mother, an Issei pioneer American. All of us Americans have a responsibility to know what happened to the lost rights and freedoms of the Japanese Americans in 1942, to help us prevent future discrimination and deprivation of our constitutional rights. We hope that equal rights, freedom, and justice will prevail." HIRO, of Alexandria, VA, is a visual and performance artist who synthesizes her American experience with her Japanese cultural heritage to create works based on East-West cross-cultural themes and issues of cultural diversity, civil rights, and justice. She is a curator of Asian Pacific American/cultural diversity exhibitions and conducts Creativity Painting workshops that focus on cultural heritage, identity topics, and civil rights/justice issues. The most personal and heartfelt of HIRO's art are the two major paintings in the exhibition, 'A More Perfect Union': 'SADA Memories: Thoughts on Justice,' and 'Justice for All.' 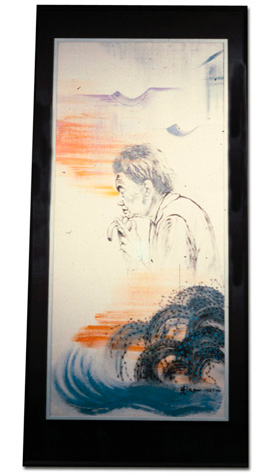 These works form the base for the series of 35 paintings, installations, and stage performances entitled 'Kimono and Barbed Wire: Breaking Barriers,' which have been exhibited nationally and internationally.